When I've had a busy day I don't want to spend a lot of time in the kitchen. And being the end of the month, I don't have the extra money for take-out. That's where my easy and delicious Kung Pao Chicken comes into play. It's literally ready in minutes and I dare say it is BETTER than the stuff you get from your local Chinese place. You're going to go wild over this recipe and I can't wait to show you how to make it! To begin pour the water into a mixing bowl. Next, pour the soy sauce into the water. Now add the rice wine vinegar. And I added just a tiny bit of salt. Oh! Before I forget, you will need to bring some water to a boil. Once at a rolling boil, add the rice. Lower the heat to a simmer, cover, and cook 20 min. As a rule of thumb it is 2 cups of water to one cup of rice. Now, back to our sauce. To the mixing bowl you will also add the cornstarch. Whisk it all together until smooth and your sauce is ready to go! Now you can place a skillet over high heat and add the oil. Once the skillet and oil are hot, add the chicken. Cook for about 5 minutes until the chicken is fully cooked and no longer pink. Now to the still hot skillet add a little more oil, the bell peppers, onion, garlic, and peanuts. Cook for about three minutes. You want the onion to be translucent and the pepper to be tender. Now pour in the sauce and turn off the heat. Let it simmer until sauce thickens. This happens instantly. Now return the chicken to the pan. Toss so that everything is coated and you're done! And it's that simple! 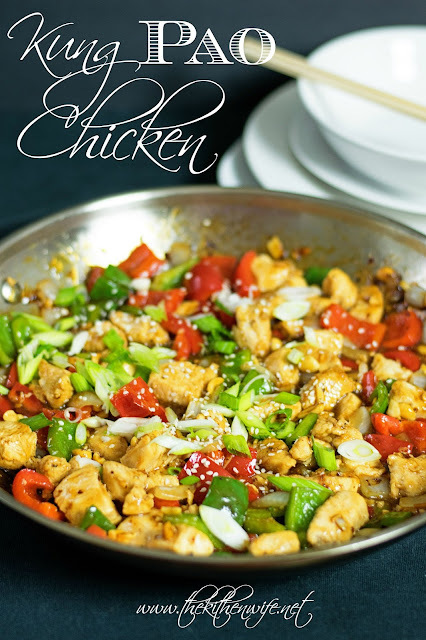 King Pao chicken, at home, in 20 minutes! Serve it over some great sticky rice and you are ready to eat! It's so bright and colorful, you can't help but to dig in! The perfect meal for those busy weeknights. Get out some chopsticks, call your loved ones to the table and it is gauranteed to be a meal everyone will be talking about for a while. 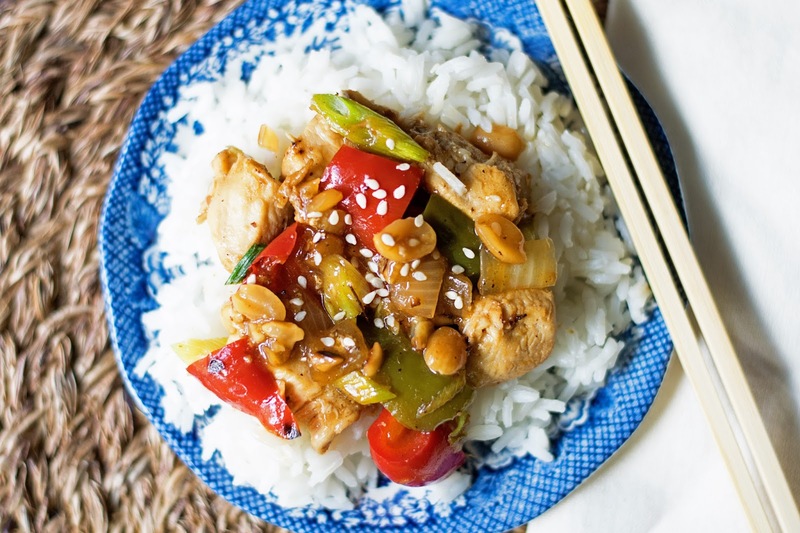 So don't go for take-out, get in the kitchen and try this Kung Pao Chicken TONIGHT! To a mixing bowl add the water, soy sauce, rice wine vinegar, honey, sesame oil, ginger, chili flake, and cornstarch. Whisk until smooth. Place a skillet over high heat and add the oil. Once the skillet and oil are hot add the chicken. Cook for approximately 5 minutes, until the chicken is fully cooked and no longer pink. Remove the chicken from the skillet and place to the side in a bowl. Add a little more oil to the skillet and place the onion, bell peppers, garlic, and peanuts in it. Cook for 3 minutes until the onions are translucent and the peppers are tender. Pour in the sauce and turn off the flame. Stir while the sauce thickens. This will happen instantly. Return the chicken to the pan and toss so that everything in coated in the sauce. Garnish it scallions and sesame seeds. Yum! I love Kung Poa Chicken!! Your recipe is a little different than the one I normally use, but I think I am going to have to try it out! Looks awesome!! Thank you! And that is what I love about cooking, it's like art, everyone has a different interpretation, but they are all delicious! What a great recipe. I love making dishes like this at home. So much better than eating out! Thanks Lady! And yes, I whole heartedly agree!